On a rainy or snowy day there isn’t much more satisfying than hot soup for dinner. Something hot warming you from the inside out. That’s when it feels like a requirement to experiment with soups. 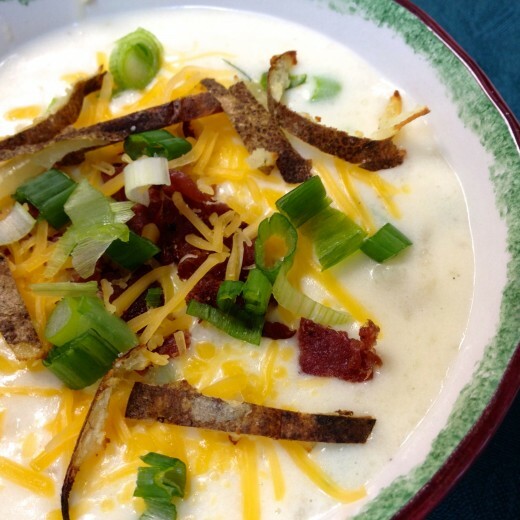 Which is how the recipe for Baked Potato Soup became a favorite of mine. Usually I use a crockpot for soup. It’s so easy to toss in whatever ingredients you like and let them simmer all day, enjoying the scents wafting from the kitchen. But baked potato soup was different. I was hoping for a recipe that would be similar to that served at a restaurant in southern California. It was one of the selections I would order often when there. It is an excellent vegetarian or “meatless Monday” dish too, as long as you still include dairy in your diet. Simply leave off the bacon that garnishes the top. It’s very filling and satisfying either way. To save time you might want to bake the potatoes the day morning before. That gives them plenty of time to cool. Then the soup won’t take long at all. It’s also been lightened up by using 1% milk, reduced fat cheese and sour cream. It smells so good cooking you will be anxious to eat as soon as it is done. Serve it to your family or to guests. It’s pretty enough for a dinner party and its taste will appeal to everyone. Pierce potatoes, then bake at 425 degrees for an hour or until cooked through. Let cool. 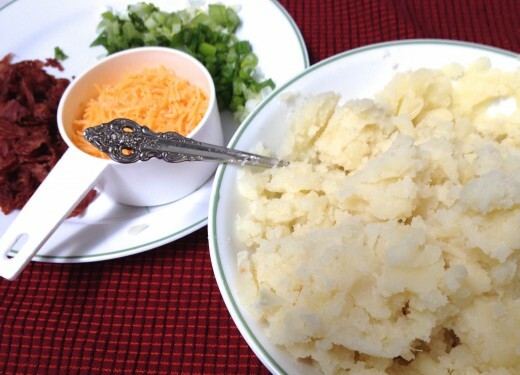 Cut potatoes in half, scoop out as much potato as possible, then mash coarsely. Set aside potato skins. Pour flour into a dutch oven. Gradually stir in milk with a whisk. Cook over medium heat until it starts to thicken and bubble (about 10 minutes). Add mashed potatoes, ¾ cup of the cheese, salt and pepper. Stir until cheese melts, then remove from heat. Stir in sour cream and ¾ cup of the onions. Cook over low heat for 10 minutes. Do not let it boil. When serving, top with chopped green onion, some crumbled bacon, cheese and the potato strips as you like. 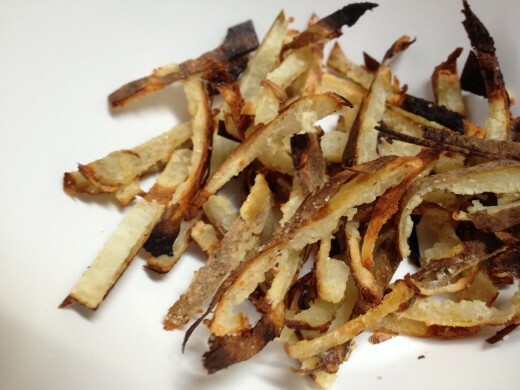 Slice some of the potato skins into very thin strips. The thinner you can get them the better. Spread out on a baking pan (I used parchment paper on mine), then spray lightly with olive oil. Season with salt and pepper. Broil for 5 to 7 minutes, or until they are crisp. When ready to serve soup, sprinkle the potato skins on top for garnishing. They add a great flavor! I love how the various garnishes add color and even more flavor to this yummy soup. My favorite is the thin, broiled potato skins. They give it a lovely crunch. Green onions or chives, capers, chopped parsley or cilantro, and grated cheese are all wonderful additions. Actually, any chopped vegetables would be a tasty garnish. For my next batch I will try adding cauliflower puree and spinach too! Can’t wait for a chilly night to fix this one again. Here is the perfect dutch oven for this recipe. The non stick surface makes for easy clean up and far less sticking than other pots. It’s big and sturdy, holds a bunch, and is a pan you will have for a decade or two. I love mine. After a dozen years it still looks brand new. I love the idea you use turkey bacon in this dish. It sounds and looks really yummy! Thank you Sandy, Turkey bacon is so great, isn’t it? I hope you try this. It’s so good! I hope you try it Barbara, it’s a favorite! Thank you. This sounds so delicious! The good thing is that it seems very budget-conscious too. The best of both worlds – thanks so much for the recipe! Thanks so much! It is Britflorida. And vegetarian as long as you leave off the bacon. It is a very satisfying soup!